The Ligue 1 club have strenuously refuted the claims. Monaco president Dmitry Rybolovlev (file pic). MONACO HAVE DENIED the claim that club owner and president Dmitry Rybolovlev allegedly stands to receive €124 million from Kylian Mbappe’s transfer to Paris Saint-Germain, as reported by Mediapart, the online investigative journal in France. Mediapart’s report is based on documents it claims to have received from whistleblowing platform ‘Football Leaks’, though Monaco have branded it “misleading”. 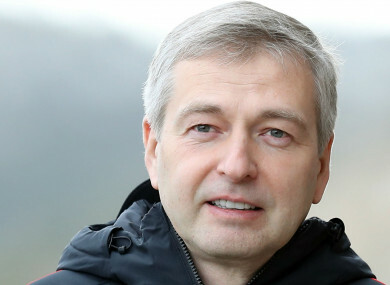 According to the French news outlet, sums of €77m and €47m from the €145m Monaco obtained from PSG for Mbappe were allegedly designated for Rybolovlev in July 2018 and June 2019 respectively. Monaco have strenuously refuted the allegation, insisting that although the funds are recoverable for the president due to previous investments he has written off, Rybolovlev has not withdrawn anything from the club’s coffers. A statement from the club read: “AS Monaco firmly denies defamatory remarks by Mediapart and states that club president Dmitry Rybolovlev did not withdraw one euro from the club’s accounts following the transfer of Kylian Mbappe. President Dmitry Rybolovlev has invested nearly 335 million euros since his arrival to fund transfers and player salaries and pay off the club’s debts. “Each season since his arrival, the club has regularly suffered financial losses. Dmitry Rybolovlev has, whenever necessary and in the interest of the club, played his role as shareholder and compensated for the deficits. Thus, of the 335 million euros invested, 182 million euros made it possible to fill these deficits recorded as of June 30, 2017. “In accounting, these transactions are called current account write-offs, and they allow the shareholder to abandon part of his current account investments and advances for cash-flow situations. In return, in order to guarantee the legitimate rights of the shareholder, these current account withdrawals are always accompanied by a return to better fortune clause. “During the 2017-18 season, with the club having made a profit, this clause of better fortune could be naturally activated. In the context of the application of this clause, the sums concerned are no longer considered as ‘abandoned’ by the shareholder and become recoverable but remain in the club’s accounts. As a result, Dmitry Rybolovlev did not recover, on a personal basis, a single cent of these sums of money, neither on the transfer of Kylian Mbappe nor on any other money entry into the club. “The current account of the shareholder is used for the operation of the club and transfers. Email “Monaco deny allegation president to receive €124 million from Mbappe deal”. Feedback on “Monaco deny allegation president to receive €124 million from Mbappe deal”.